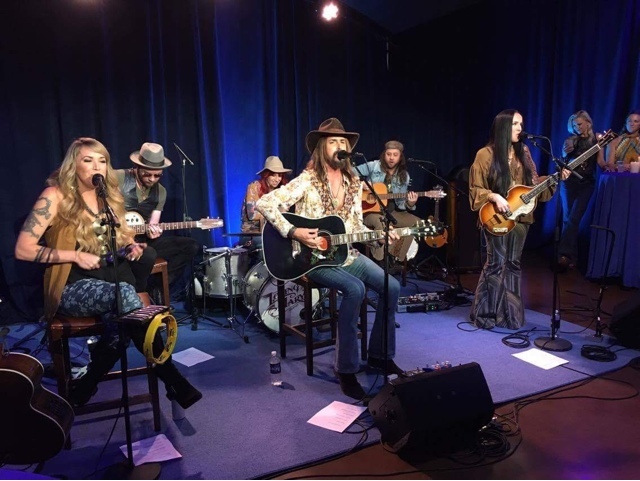 On October 19, The Loving Mary Band performed a short concert at AURORA Nashville for a live audience and online listeners. AURORA Nashville is a new venue which live-streams concerts online to those who create a free profile on their website. All of their concerts are streamed in 4k, which puts them on the cutting edge of the live streaming entertainment industry. The Loving Mary Band is comprised of six of the most talented musicians in Nashville, Rebecca Lynn Howard, Suzie McNeil, Marti Frederiksen, Elisha Hoffman, Andrew Mactaggart, and Sarah Tomek. The band’s chemistry radiates from their music and their stage presence, and their sound has calls to both modern country and slight strokes of 70’s southern rock. The band has gained a good bit of notoriety, seeing that they serve as Steven Tyler’s backing band when he does his solo concerts. Tyler has ventured into the country music genre when he’s not rocking out with Aerosmith, and The Loving Mary Band has done an excellent job of bridging the gap between the country sound Tyler strives for and the rock sound that is engrained in his soul. The Loving Mary Band’s debut record comes out on October 28, and after hearing some of the songs live at AURORA, I promise that this will definitely be a record you want to listen to! SYLVIA'S 'IT'S ALL IN THE FAMILY' AVAILABLE NOW!